Sgt. 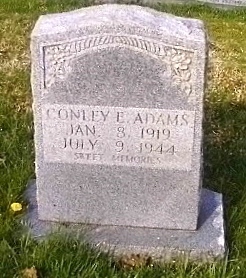 Conley E. Adams of Elk Valley has been reported killed in action in France July 9. Mrs. Elsie Adams, his wife, has been notified. Sgt. Adams had been in the service since 1940 and overseas since January of this year. He is the son of Mr. and Mrs. Jess Adams of Wooldridge. Another Elk Valley boy reported killed in action is PFC James Jeffers. He is the brother of PVT Sylvester Jeffers. PFC Jeffers was killed in Italy and his parents have since received the Purple Heart, it was said. 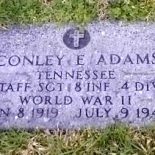 S Sgt Conley E. Adams, born January 8, 1919, son of Mr. and Mrs. Jesse Adams of south Jellico, Tenn., entered the service of his country September 20, 1941, and was killed July 9, 1944. The body arrived in Jellico Wednesday, July 14, and the funeral service will be held Sunday, July 18 at the tabernacle. Surviving are his wife and parents. Interment in the Jellico Cemetery. Ellison’s in charge. The bodies of four Knoxville men who lost their lives in the European theater of World War II are being returned to the United States aboard the U.S. Army transport Greeneville Victory, the Army announced yesterday. The vessel, arrival of which will be announced by the New York Port of Embarkation, is carrying the remains of 3734 American war dead, including 134 Tennesseans. The Knoxvillians and their next of kin Pvt. Fred B. Bates, Thomas A. Bates, Route 4 Pfc. Edward L. Henderson, William H. Henderson, 911 Coleman Street Pfc. Earl C. McCoy Frank V. McCoy, Route 5 and Pvt. Rayford C. PaskellCoy J. Paskell, 116 Rudy Street. Other East Tennessee war dead aboard the vessel are Staff Sgt. Conley E. Adams, Jellico Pfc. Fred E. Ball, Rogersville Pvt. Willard R. Ball, Kingsport Pfc. John D. Bell, Cleveland Pvt. 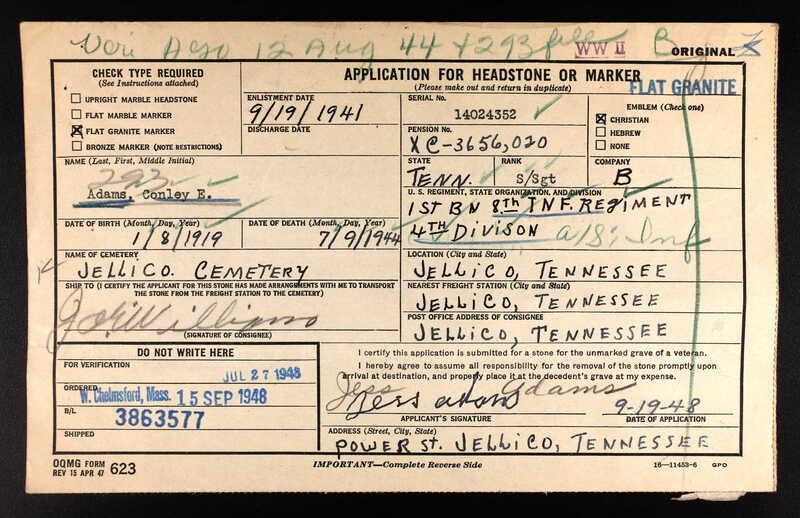 Virgil L. Bivens, Lenoir City T5 Fred J. Blevins, Jamestown Pvt. Henry E. Brassfield Jr., Jelico Pvt. George R. Brown, Greeneville T5 George A. Cannon, Strawberry Plains Pfc. John H. Cassel, Kingsport Pfc. Reeldon R. Chambers, Cleveland Pfc. Paul Z. Crabtree, Rockford Pvt. Charlie L. Cross, Jonesboro Tech. Sgt. 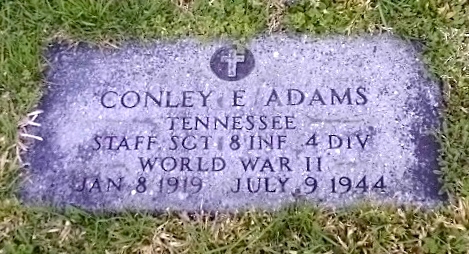 Norman L. Daniel, Tullahoma Pfc. Hubert Davis, Old Fort Pvt. William E. Ellison, Bristol Pfc. Paul A. Freels, Maryville Pfc. 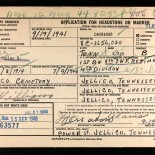 Enos B. Gardner, Tellico Plains Pvt. Reed J. Gaston, Delano Pfc. David R. Guy, Maryville Pfc. Charles E. Jarnagin, Harriman Pfc. Bobbie W. Jennings, Greeneville Pvt. Paul A. Kerr, Maryville Pvt. Fred A. King, Cleveland Pvt. Quincy H. Lpng Jr., Jellico Pfc. D.L. Messer, Cleveland Pvt. Carvel E. Moles, Crossville T4 John T. Moore, Greeneville Pvt. Roy J. Newman, Jefferson City. Pfc. Thomas D. Pierce, Jamestown Pvt. Richard Privett, Bristol Pfc. Seaborn M. Roddy, Dayton Pfc. Charles W. Saylor, Elizabethton Sgt. James D. Shiflet, Bulls Gap Pfc. J.D. Smelcer, Parrottsville, Pfc. Eugene W. SMITH, Etonwah Cpl. Hugh P. Smith, Cookeville T5 John S. Stafford, Maryville Pfc. Robert Stills, Johnson City Sgt. Charles W. Stout, Harriman Pfc. Thomas D. Tankersley, Dayton Sgt. William H. Whitson, Elizabethton. 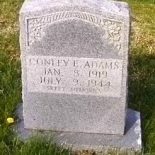 NOTE: Both photos of the military grave plaque and the family plot stone of CONLEY ADAMS by Larry and Edie Doepel; photos researched and submitted by KATEY MISHLER.